A book-signing can be a pretty “square” event—it has four sides to it! One, the author, who sits out front, waiting; two, the bookstore, hoping this odd fellow will draw a bit of a crowd that buys; three, the publisher, hoping that there will be no returns in a month or two; and four, the book-buyers—will they or won’t they come? In late November in Ottawa, I experienced, as the author of Angel in Blue Jeans (Richard L. Coles), a book-signing that was far from square. First, there was a fifth dimension—the weather. Previous days had been mild and often sunny, and roads were dry. But two hours before the book-signing, the forecasted storm broke, with driving winds and lashing icy snow pellets that glazed the roads and were whipped into frenzies. Timid drivers and walkers paled at the onslaught. But this intrepid author, with his consort, reached the bookstore and set up camp (there was a Seattle-based coffee shop in the store). And yes, despite the weather, ardent customers were not deterred. 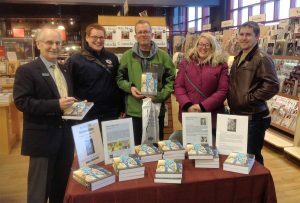 There was a bit of a crowd; at times, there was a jolly crowd greeting one another as books were bought and signed; and not all buyers knew the author—indeed, total strangers bought, and that is good, very good. Yes, behind all this bustle lay the chores of arranging the signing, the messages back and forth, the worries that books would not arrive in time, that no-one would come. But this time, it worked well. 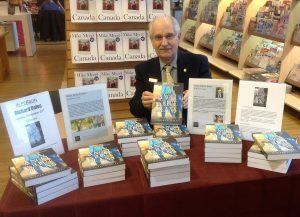 The location just inside the store entrance was right, just where the author could stand smiling and catching the eyes of people coming in, as they shook snow and ice from their heads and felt the warmth and welcome. A good read always triumphs over bad weather!